Fox' Bar and Restaurant Review: Shift, 17 General Eremia Grigorescu St. 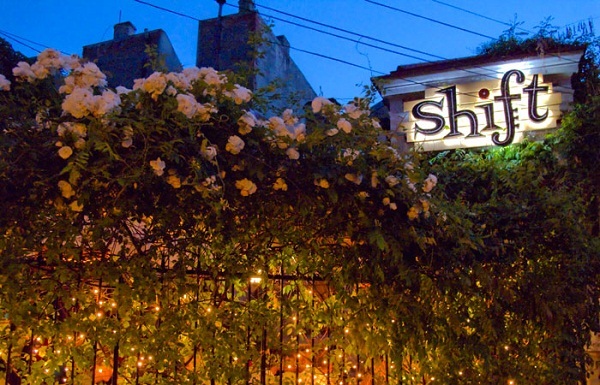 Shift opened its doors in the summer of 2010 tucked away in General Eremia Grigorescu St. just behind Bulevadul Dacia, in that area of Bucharest that makes you feel as though you could be in Paris or Buenos Aires. This bar and restaurant is housed in a delightful old three-storey house which dates back to the early 1900's. It has a simple and uncomplicated interior design which highlights the original features of the house, wooden floors and furnished with tables and chairs that compliment. Outside there is a terrace which is protected from the road by tall cast iron railings to give the feeling of seclusion and privacy. Inside the ground floor, the bar area has an open plan space seating around 50 people. On the first floor there are two main rooms divided by an adjoining passage way, with a small snug up in the roof. Here there is a low wooden bench seating covered in bright selection of scatter cushions, which would be a great area to reserve if you were looking to have a party with around 20 friends. A very good feature of Shift is the continuity of the bar and restaurant areas making every table available for eating or just drinking. The photos on the website give a good impression of the interior space. The menu is very comprehensive offering a wide range of Western cuisine and as well as other interesting dishes. I started with home made mushroom soup, as good as my mother’s. The main course was an excellent piece of beef served in a cheese sauce, certainly different and maybe controversial but which worked very well. We were a table of four and were all very happy with our choices. The wine list has an excellent selection of Romanian top wines all priced very honestly. We disposed of two bottles of the Cuvee Charlotte by Terra Romana, which complimented the food very well. The only oversight in the wine department was the glassware: not up to the quality of the wine. The standard of service was excellent, friendly, welcoming and prompt with both food and drink. Shift is now a favorite of mine and I am keen to try more of their interesting menu. The spicy beef is next on my list!